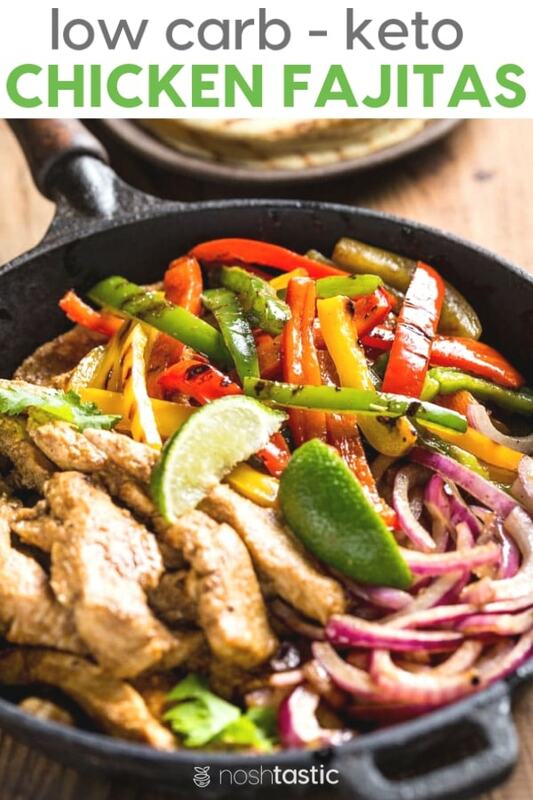 Low Carb Chicken Fajitas are a tasty keto weeknight chicken dinner option that will keep your whole family happy, even those are not following a low carb diet will love them! My kids eat these with regular gluten free tortillas and I use low carb tortillas to keep the carb count low. 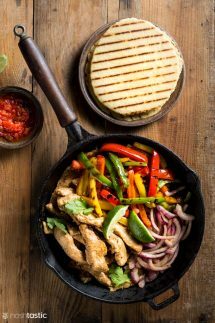 The meat and vegetable filling for the low carb chicken fajitas comes in at around 7g net carbs per serving. This does not include any extra items like the tortillas, or any additional topping such as sour cream, cheese, guacamole, etc. Best tortillas to use for Low Carb Chicken Fajitas? There are two options for low carb and keto tortilla recipes for you to choose from, you can pick either an almond flour Low Carb Tortilla, or a Keto Coconut Flour Tortilla recipe. I realized that many people either can’t have one flour or the other, or they simply prefer one over the other so you can pick the recipe that best suits your needs. The coconut flour tortilla is naturally softer as there is more fiber in it, but both recipes are great options and you can use them for the fajitas. If lowest net carbs are your primary concern then pick the coconut flour tortillas, they are slightly lower coming in at around 2g net carbs per tortilla, and the almond flour versions are around 3g net carbs per tortilla. 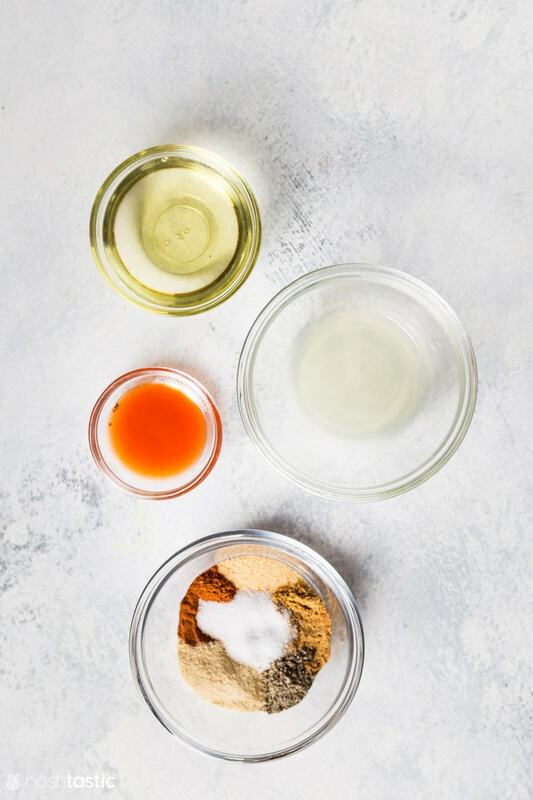 Start by measuring out the olive oil, lemon juice, and hot sauce for the fajita marinade. Then mix together the cumin, garlic powder, paprika, onion powder, salt, and freshly ground black pepper into a large bowl or a ziplock bag for marinating the chicken, and pour in the liquids and mix well to combine. Next, you’ll need to slice the chicken breast pieces into even sized chunks. Once you’ve done that simply add them to the bowl or ziplock bag along with the marinade and mix it really well to ensure that all the pieces of meat are evenly coated. You’ll need to marinate it for at least a minimum of thirty minutes, preferably an hour, and put it in the fridge while you wait. 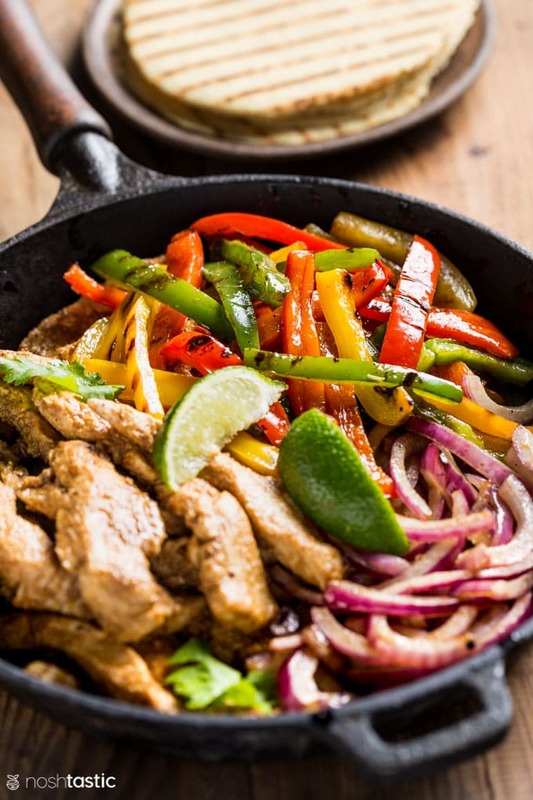 While the meat for your low carb chicken fajitas is marinating you can go ahead and prepare the vegetables so they are ready to cook. You can chop them any way you prefer, but I like to cut them into thin slices so that they fit into the tortillas more easily. I used red onions as I love the flavor, but white onions work perfectly well too. Heat a large cast iron skillet with about half the olive oil and then add the chicken. Cook it for about ten minutes or so, stirring frequently until chicken is cooked all the way through. Set the cooked chicken to one side and wrap it in foil to keep warm while you cook the vegetables. Stir fry the sliced vegetables in a hot skillet with the remaining oil for about three to five minutes or until they are as soft as you prefer them. Then add back the chicken into the skillet to warm through. Serve hot with low carb tortillas, sour cream, guacamole and lots of shredded cheese. Large Cast Iron Skillet – This is a staple in my kitchen and I use it daily for cooking all sorts of things. If you don’t already have a cast iron skillet I’d urge you to get one. Cast Iron Grill Pan – not required, but if you want to get those great grill marks on your chicken and vegetables then this is the cast iron grill pan I used for this recipe. Cutting Boards – I have this set and it’s served me well and can go in the dishwasher. Sharp Knife – this is very similar to the one I have in my kitchen. Tortilla Press – The best way to make even and thin low carb tortillas is with a tortilla press like this one. 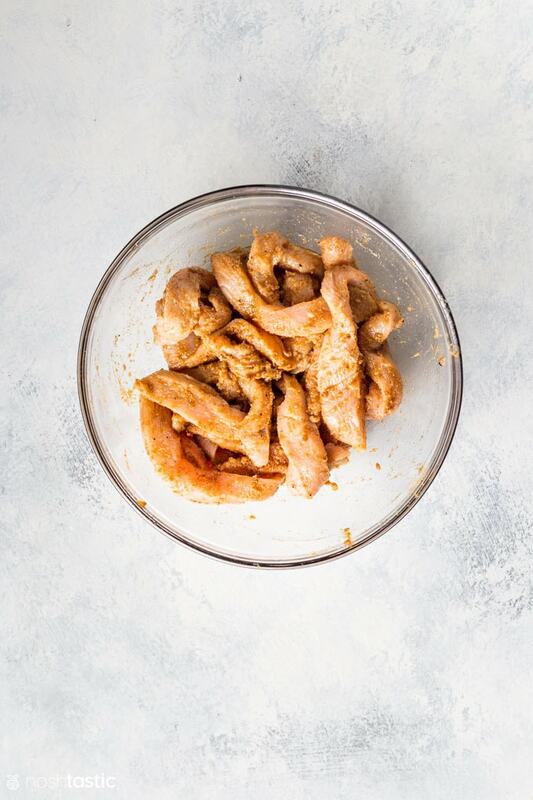 Put the low carb chicken fajita marinade ingredients into a large Ziploc bag (or bowl) and mix well. While the chicken is marinating prepare the vegetables by slicing them into thin strips. Heat a large skillet with half the oil and add the chicken pieces, cook for at least ten minutes, stirring frequently until chicken is fully cooked. Remove cooked chicken to a plate and wrap in foil to keep warm. 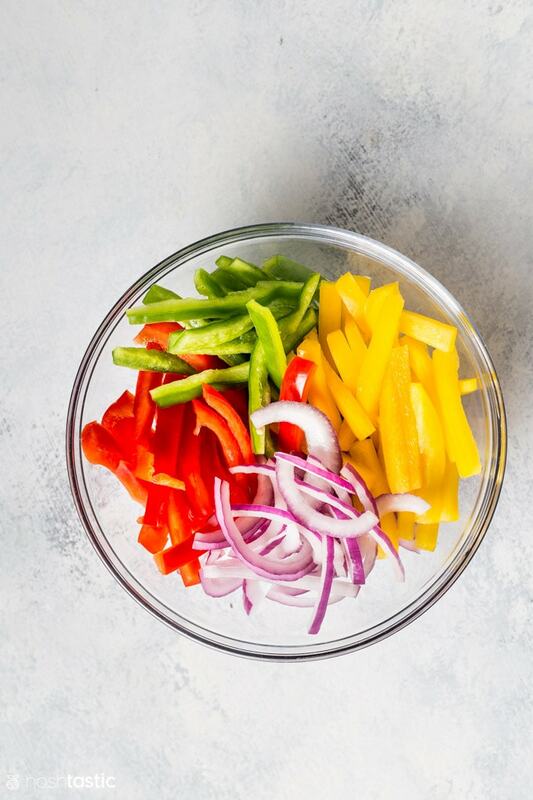 Add a little more oil to the skillet and cook the onions and bell peppers for three to five minutes or until they are as soft as you like them. Once the vegetables are cooked add the chicken back to the pan and warm it all through. Serve immediately with low carb tortillas and any combination of salsa, guacamole, sour cream, and shredded cheese. 7g net carbs per serving, this does not include tortilla or extra toppings. Use lettuce wraps instead of low carb tortillas to be whole30 compliant.